Give care to survivors - Head to mapyourvoice.org/map and click the support buttons on the map to show survivors that you believe them and encourage them. It is incredibly difficult to speak up about one’s assault and commending their bravery goes a long way toward acknowledging this! Reach out - Reach out to your friends and family and let them know you care about them. You never know what someone else might be going through and that little nudge of warmth could truly turn someone’s day or week in a positive direction. Here's a link to our 10 Ways to Support Survivors for a refresher on how to best care for the survivors in your life. Volunteer - Volunteer for organizations with values similar to yours or one that you admire. Hands on help is truly appreciated in the nonprofit world and always needed to help the organizations pursue their important missions! Fundraise- Nonprofit organizations survive on generous donations, so why not help by fundraising? 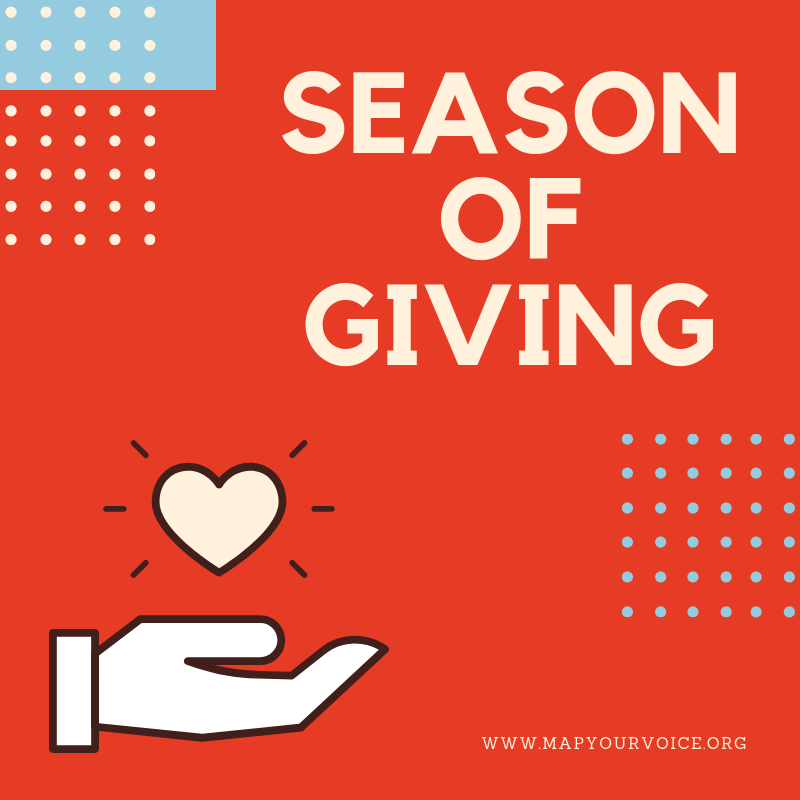 Help raise money in your own community for MapYourVoice in order to help us continue to support survivors of sexual assault globally. Donate- MapYourVoice is currently raising funds to produce printed materials that can be given to survivors at police stations, hospitals, school campuses and more. Help us reach survivors in need by donating now! There are so many ways to give this season. How will you be getting involved?